The Countryman E6 omnidirectional wireless earset is an unobtrusive, world-class mic that delivers high-quality voice pickup while rejecting surrounding noise and feedback. 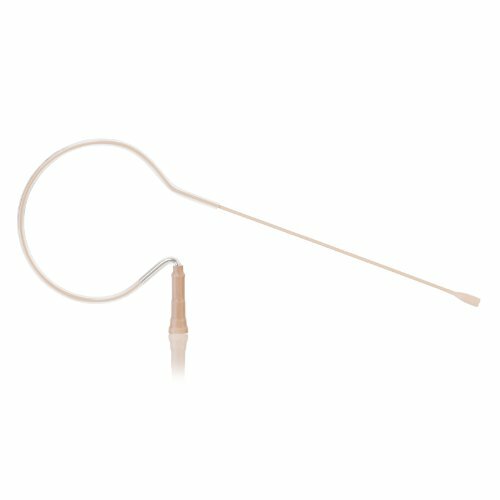 An ultra-miniature electret condenser element is held close to the mouth by a thin boom and comfortable earclip. The omnidirectional element is nearly immune to wind and breath pops, even when used without a windscreen, while the boom keeps it very close to the mouth for excellent isolation. Smallest, lightest, most comfortable mic of its kind, only 1/10th ounce. Almost invisible against any skin tone. Rugged, bendable boom is easily adjusted to hold the perfect custom fit. Hands-free, wireless-enabled mic allows total freedom of movement. Rugged and reliable, virtually unbreakable steel boom. Stiffer boom is easily adjusted yet holds its shape, making it perfect for single-wearer applications. Exclusive snap-on cables for field replacement or compatibility with various wireless systems. Highly resistant to sweat and water when used with protective frequency-response caps. Fits Audio Technica transmitter models T27, T31, T51, T200, T201, T210, T300, T310; 1100, 1400, 2000, 3000 series and Hirose 4 pin connector. Includes 2-mm Duramax aramid-reinforced cable. Features gain sensitivity for speaking, vocals and classic/springy boom. Available in light beige color.